For many years, Facebook had a reputation for being a branding tool more than a channel you can use to convert leads. However, thanks to a string of new targeting and ad features – plus some savvy marketing skills – Facebook has matured into a powerful selling tool for bands in every industry. If you know how to get the best out of these features, you’ll be using Facebook to generate qualified leads and guiding them to the final purchase. Don’t take my word for it, though – try out these seven Facebook ad conversion tips to increase your profits today. Unlike the people you target with AdWords ads, Facebook users aren’t actively looking for products. They’re browsing through their friends’ holiday snaps and watching videos of dogs wearing ridiculous outfits, which means buying intent on the News Feed starts at zero. So don’t go right for the product sale with all of your ads. Start by target soft conversions (website traffic, email subscriptions, etc.) on the News Feed that you can nurture along the buying process with email marketing, remarketing and the other tactics we’ll be looking at today. To capture this kind of lead you’ll want to use relatively broad targeting options and messages. Go for visually striking, branded ads with minimal text that play on the basic desires: hunger, lust, escapism, making money, saving money, respect from peers, etc. These are generic but powerful themes that get your brand message across instantly. And this couldn’t be more important when people are quickly scrolling their News Feeds. 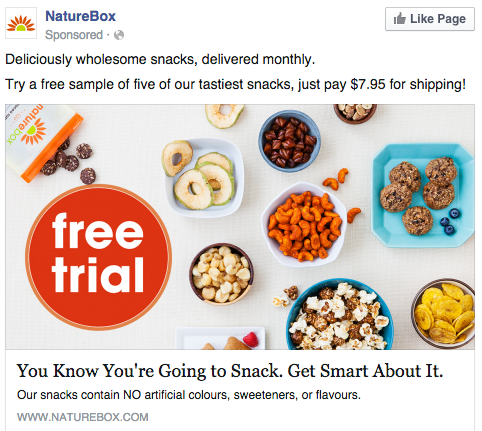 In the ad above, Nature Box plays on the most basic of all guilty pleasures: snacking. The message is simple: you know you’re going to do it, so wise up and try out our free trial. It’s a difficult prospect to resist and the image packs a punch with tempting snacks and that “free trial” icon that instantly grabs your attention. The end result is an ad that’s hard to ignore and a message that’s equally difficult to resist, no matter how low buying intent may be. 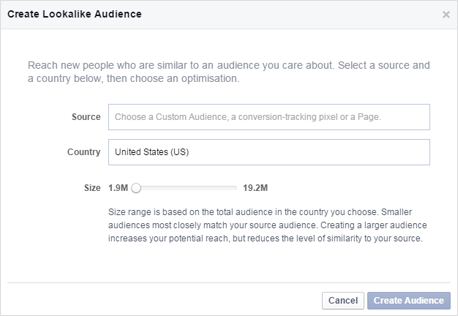 Facebook’s targeting options are immense, allowing you to pinpoint highly specific audiences that are likely to buy into your brand. Unlike the kind of campaign I was talking about above, which is designed to generate large volumes of soft conversions, these campaigns are going right for the sale. To make this happen, you’re going to layer targeting options to reach highly focused audiences and create ads specific to them. Let’s say you’re a travel brand, for the sake of example. Your broad campaigns (like the one I described above) will play on the basic desire everyone has to travel, escape their job and taste luxury. You’ll also be targeting soft conversions with those campaigns – something like signing up for price updates when the hottest deals are available. However, with this campaign, you’re going to get people booking holidays right now. 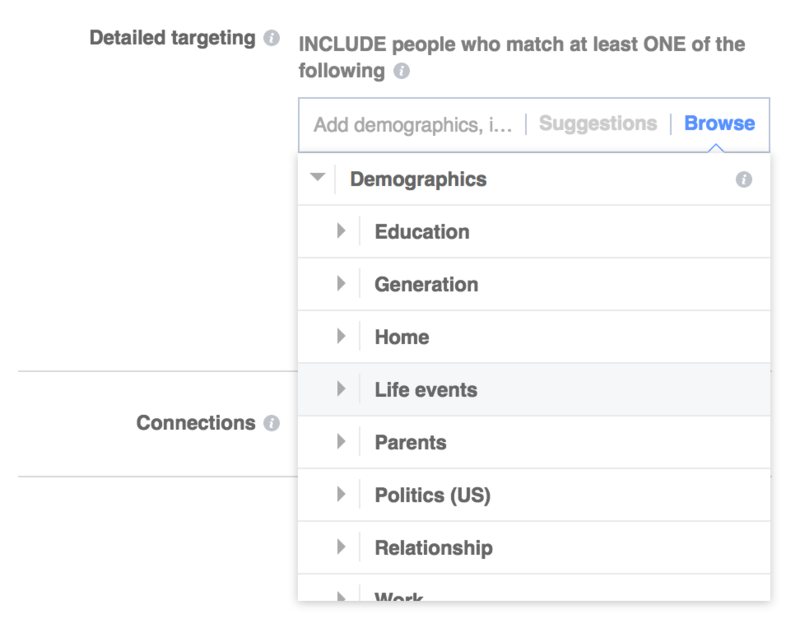 By targeting Life Events on Facebook you can reach people who have a wedding coming up; people in the market for a honeymoon. So, instead of generic holiday ads, you target these people with offers for the ultimate honeymoon. Then, you can layer some demographic targeting on top of that to target men who are about to get married, offering them the perfect honeymoon for her. You’re not done yet, either. You can use interest targeting to pinpoint couples who’ve shown an interest in cruises or other holiday types. The list of targeting options goes on and there’s almost no limit to how specific you can be. The trick is to find that sweet spot where your ads are being seen by enough people to maximise leads, but guarantee they’re qualified with a high possibility of converting. This is just one example of how you can tailor your products to a highly specific audience and create ads they can’t resist. Mastering Facebook ad targeting is key to everything you do on this network. Facebook optimises its ads for a wide range of campaign objectives and you’ll be asked what your advertising goal is as soon as you go to create an ad. This includes a Conversions objective which allows you to target new and previous visitors based on actions they take on your site, in a similar way to AdWords remarketing. The great thing about the Conversion objective is it allows you to track a wide range of actions users take on your site and use this to place where they are on your sales funnel. With this attribution you can create ads designed to nudge them along the buying process and I’ll be talking about how to do this in more detail shortly. Once a user clicks your ad, that’s traffic you’ve paid for and every lead that slips away hits you in the pocket. This is where your website needs to be optimised for conversions or you’ll be spending your budget on traffic for nothing. This starts with landing pages that inspire people to take action and you can check out some of our recent posts on landing page best practices for tips on that. Don’t forget most of your Facebook leads will be coming from mobile so having fast, mobile-optimised pages is a must. Pay close attention to your web forms, too, to make sure they’re not getting in the way of conversions. Use a good form optimisation tool to highlight any problems your forms are causing and put them right to minimise the number leads you lose. 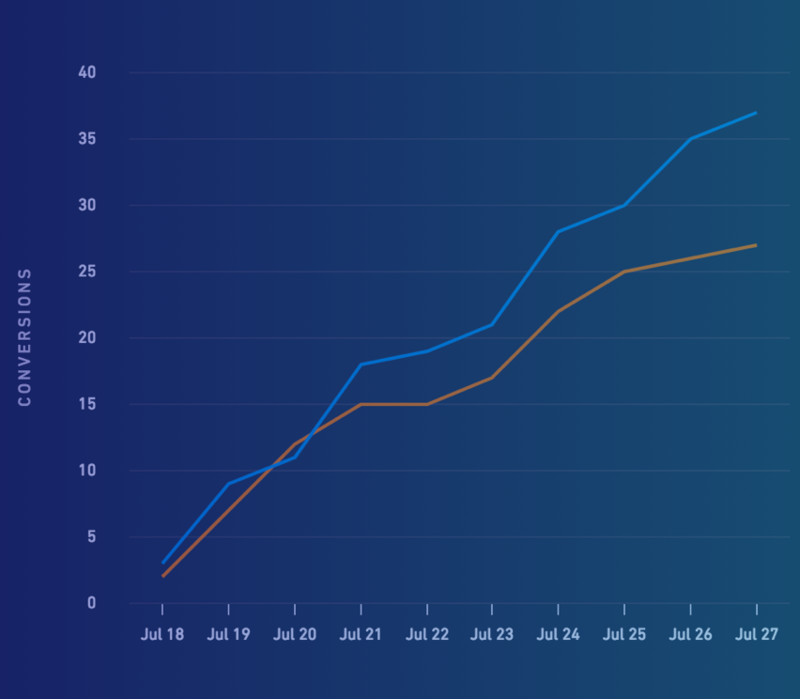 Conversion tracking: See how successful your ads are by tracking the actions users take after clicking through to your site. Optimise bids for conversions: Automatically adjust your bids so ads show to people who are more likely to convert. Remarketing: Target previous visitors who didn’t convert the first time with remarketing ads. Reach a wider audience: Use Lookalike Audiences to reach people with similar interests as your existing customers and leads. So the first thing you can do with Facebook Pixel is target previous visitors with remarketing ads – either all of your visitors or people who visit specific pages. You can also target people based on specific actions they take on your site: when they search on your site, add something to their basket, complete a form or buy a product, for example. This allows you to create highly targeted remarketing ads based on the actions visitors have taken on your site. Once again, you can take this even further. Using Facebook Pixel and Lookalike Audiences you can target people who have things in common with the people already interacting with your brand. You create an ad for this audience, choose how large you want your Lookalike Audience to be and Facebook takes care of the rest. To create a Custom Audience you upload email lists and Facebook finds the accounts of those people, allowing you to target them with ads on Facebook. So you can upload your email marketing lists and target your existing customers and leads, whether they initially came from Facebook or not. You can then use your Custom Audiences to create more relevant Lookalike Audiences. Instead of simply uploading your entire email list and create a single Custom Audience, upload segmented lists based on the actions people took when they first signed up. Let’s say you’re in the SaaS business and three of your most important email segments are newsletter subscribers, free trial users and existing customers. By creating three different custom audiences with these email segments you can target subscribers on one list with ads tempting them to sign up for your free trial. Using another list you can target those already signed up by offering discounts for buying the paid version. And, using your third list, you can target existing customers with offers for upgrading to a more expensive package. So whatever stage of the buying process people on your email list may be, you can use segmented Custom Audiences to nudge them on to the next. Your Custom Audiences are merely the start of it as well. Once Facebook links your email lists to real-life accounts you can apply all the targeting options you like. So now you’re able to filter out your ideal prospect and create highly specific buying personas. Then you get Facebook to create Lookalike Audiences based on these profiles and the network will find new leads that fit the bill. All of the tips I’ve covered so far will help you increase your profits but they’re also building up to the big finale. The whole point of targeting soft conversions, using Facebook Pixel and everything else I’ve covered today is so you have the resources in place to move prospects from one audience list on to the next. Which means, by creating relevant ads for each stage of the sales funnel, you can target prospects with different ads as they move along the sales process. Best of all, you can effectively automate this process with audience lists so Facebook takes care of the lead nurturing for you. As soon as a user completes the desired action, they’ll be moved onto the next list targeted with your ads to move them on once again. Each of the Facebook ad conversion tips in this article will help you increase profits in their own right. But, by putting them all together, you’ll have a solid Facebook strategy that grabs leads at the earliest stage of the buying process and moves them along each step with targeted ads. This is where Facebook comes into its own as an advertising platform and, if you can get your head around the extensive targeting options available, you’ll pretty much be running the show.